This was written in early 2007, before the refurbishment of St George’s Square. The reader may judge whether the changes have taken the Square nearer, or further away, from Ruskin’s ideas of architectural fidelity: note the installation of such features as a waterless fountain which looks like a giant urinal, water spouts bursting through the flagstones, and the replacement of Yorkshire stone with Chinese granite. –shining a little Neo-Ruskinite light on a part of Huddersfield . St George’s Square – Lion Arcade with Britannia Buildings to the right of picture. ‘I can’t help grieving to see so lamentable a mismanagement of one of the finest sites in Yorkshire… to find such splendid buildings thrown into an unshapely, awkward looking, falsely called square…I cannot help thinking and saying that with such palace like warehouses on one side, the railway station on another, the George Hotel on the third, every stranger who alights from the railway must be filled with amazement that so much money could have been expended and so ineffective a result obtained’. As an architectural dilettante, the writer was no doubt illuminated by John Ruskin’s Seven Lamps and, casting their light on St George’s Square, had found it aesthetically and morally wanting. However, he could not have known that ‘so ineffective a result’ would, a century and a half later, survive as the most widely renowned and locally loved area of the town. The Lamp of Memory has shone favourably on the Square and, even if its buildings have not yet attained the veneration of centuries, its character has been shaped as Huddersfield’s ‘centre manqué’. Only by paying regard to its role in the history of the town, in the meaning it had for its builders and townspeople, can we do justice to the Square as it remains today. As in the memory of a person, the symbolism of the past and the living reality are often paradoxical. The central paradox is that this ‘might have been’ town centre never achieved that potential, while the buildings which define it are also replete with their own ironies and historical allusions. The Square’s aspiration to be the symbolic heart of the town, is evident in the very name invoking the patron saint, in the Britannia Buildings, crowned by the personification of Empire, and in the Lion Arcade, with its beast epitomising imperial strength and power. The station, the original focus of the square also radiated imperial symbolism of a different kind, celebrating the dominance of industrial and commercial might. Built as the economic and political turbulence of the 1840’s was giving way to the new era of confidence in industrialism and technological progress, ( embodied in the Great Exhibition), the station enshrined the apogee of modern technology in the garb of ancient civilisation. The only other notable neo-classical building in Huddersfield, the Infirmary, with its portico of the Doric order, reassuringly solid, unostentatious and harmonious invokes the image of a temple of Asklepios the Healer. In contrast, the station, employing monumental Corinthian columns on massive dados, projected an altogether different sacred image – the cult of Roman imperial grandeur and magnificence. Like the Roman Legions, the railway companies carved their straight roads across the country linking remote outposts of industry. The victory celebrated was not only that of the railways, but of industrial civilisation. To perceive the station merely as ‘railway architecture’, is to disregard its’ fundamental role as a triumphal portal, a symbol of the town’s industrial and commercial achievement. This triumph also relied on martial victories, and, as if as a reminder, two Russian cannon, trophies of the Crimean War, were later placed in the forecourt. However, this was a grand façade in both meanings of the term. It also disguised an irony. Ruskin abhorred railways, considering any decoration of stations wasted on the stressed passengers scurrying to their destinations. Although he too envisaged them as temples – it was as the ‘very temples of discomfort’, a description that could have been derived from Huddersfield. Two decades after its completion there were complaints not only that Huddersfield station was dirty and uncomfortable, but downright dangerous, with passengers having to cross the line to reach the platform. An inquiry found it was ‘so inadequate as to endanger safety…’ and the Board of Trade recorded 41 casualties at or near the station, including 9 killed, between 1854 and 1870. The Town Council and Chamber of Commerce, concerned that the poor facilities were also endangering the trade of the town, tirelessly lobbied the railway companies, but, as late as 1884, promised improvements to the line and platform had not materialised, prompting the Huddersfield Chronicle to complain that townspeople were ‘still compelled to put up with the inconvenience and discomforts of their forefathers…’. The feelings of the stranger, alighting from the railway into the Square, were more likely ones of relief at escaping the smoke, noise, dirt and bustle, rather than amazement at the architectural vista before him, ‘ineffective’ or otherwise. 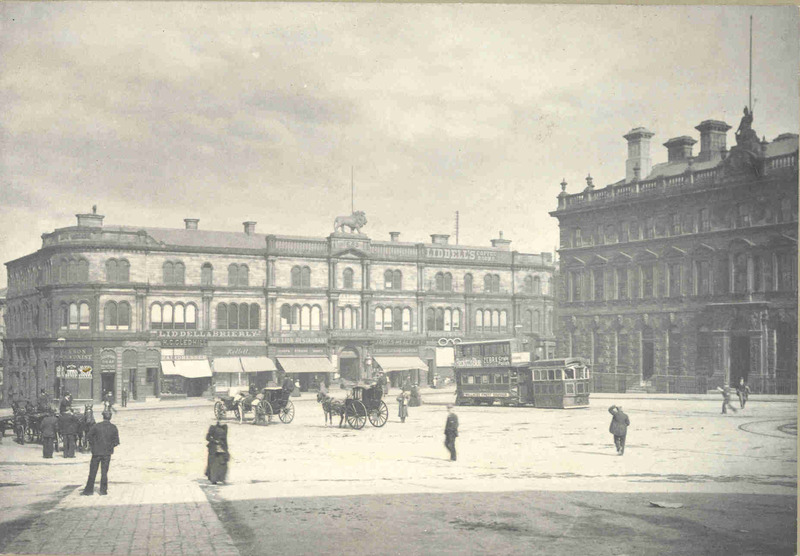 If the station was the foundation stone of the Square, the first corner stone was the George Hotel. It was the removal of the old George which had made the creation of the Square possible by opening a road from the Market Place. That George had always been more than just an inn or hotel, serving as a focus of political, social and cultural activity. It was an integral part of civic life. Political power was brokered, deals done and decisions made determining the running of the town. The resurrection of the new George in the Square was intended to shift the centre of gravity from the old Market Place, with all its old connotations of tumult and riots, to the new centre of the town. Appropriately the new hotel was built in Italianate style, invoking the high Renaissance Palazzo as the seat of economic and political power, where rich merchants determined both the commercial and political fortunes of city states. This aspiration was soon to be reflected more grandly on the opposite side of the Square, in the even larger and more richly decorated Britannia Buildings, built by merchant-manufacturers George Crosland & Sons. In contrast to the rectilinear solid Palazzo, another wealthy manufacturer, Samuel Oldfield, chose an earlier style of Byzantine-Venetian rounded arch fenestration for the façade of his Lion Arcade. The ground floor accommodated shops and a less forbidding appearance than that of Britannia Buildings was more appropriate. Like the Venetian fondaco, it contained the warehouses and counting houses of merchants whose wealth, was also built on fine textiles. While many a Venetian merchant’s fortunes sank with his galley, a Huddersfield merchant’s prosperity was at the mercy of equally unpredictable economic storms. A year after opening the Lion Arcade, Oldfield, was bankrupt and his estate up for auction. Nevertheless, despite periodic bad trade and financial failures, these grand buildings confidently signified the Square’s aspiration to become the central piazza of a rising city state – a new Venice, or Florence. But this architectural metaphor also reflected a political paradox, one which those who glibly use the term ‘Renaissance’ without seeing its dark side, should pay heed. Although a modern industrial town, Huddersfield, like the city states of Italy, had its own feudal prince in the person of John William Ramsden, against whom the worthy burgers periodically battled. Though long and of Machiavellian complexity, this strife was not so bloody as that between the borghesi and the Medicis, or Borgias. It more often descended into farce, none more ridiculous that the attempts of Ramsden to banish the statue of Sir Robert Peel from the town, until the marble statesman was offered asylum by the railway company on a plot in front of the station. This antagonism also sank the estate’s ambition to make the Square the heart of the town by locating the seat of civic government there. In the early 1850’s argument’s against a Town Hall ranged from loyalty to the Philosophical Hall, which already provided most of the facilities and had a sizeable debt to clear, to the more pressing need for a covered market. One of the Improvement Commissioners, in a letter to the Examiner in 1851, suggested that Sir Joseph Paxton (architect of the Crystal Palace), be sent to the old Market Cross to design a new market. Then with ‘a few pillars, a few sheets of glass, a few days work and the thing will be done at trifling cost…’ A flippant proposal this may have been, but it showed the underlying cynicism towards the Ramsden project to move the town’s centre of gravity from its historic focus. In 1878 when plans for a Town Hall were already well advanced, Joseph Crosland, owner of Britannia Buildings, led an eleventh-hour deputation to the mayor to urge that a more central position should be chosen than the favoured site on Princess Street. A vacant plot behind the Lion Arcade, reserved by the Ramsden estate for just such a public building, was argued to be a more suitable location. As a result of this rivalry, Huddersfield ended up with a Town Hall defiantly sited on the opposite side of the town, which seems, resentfully, to turn its face away not merely from the Square but on the town as a whole. The Square may have lost the main public building of the town – but this did not stop it becoming the chosen forum for the mass expression of public opinion. There was another powerful force at work, one which Ruskin held in contempt almost as much as the railways – democracy. The creators of the wealth expended on such opulent buildings and of the fine woollen and fancy cloths which filled the merchants’ warehouses, had been the backbone of the now fragmented Chartist movement. Even in the 1860’s many were still handloom weavers, working in their own homes for starvation wages. Only those able to enter the once detested factories were able to share the benefits of relative economic stability – but they had no share in shaping the town, still less in running the country. However, the spirit of democracy had not died with Chartism. Even as the Square was still taking shape its utility as a site for large public gatherings was exploited. In the 1853 elections Lord Goderich, the Liberal candidate, addressed a large crowd of his supporters form a window of Shaw’s warehouse in the Lion Arcade – mostly working men ‘non-electors’ who didn’t have the vote. At the election hustings in July 1865 an estimated 18,000 people crammed into the Square to hear the candidates, while the following year thousands of working men and a dozen bands assembled in support of a Parliamentary Reform Bill to extend the franchise. On this occasion the George Hotel played only a minor role, as a refuge for a couple of hecklers manhandled by the crowd, while thirty years before, during agitation over the First Reform Act, its predecessor had been the main target for a hail of stones and brickbats. However, it was only with the passing of yet another Reform Act in 1884 that the majority of men won the vote. 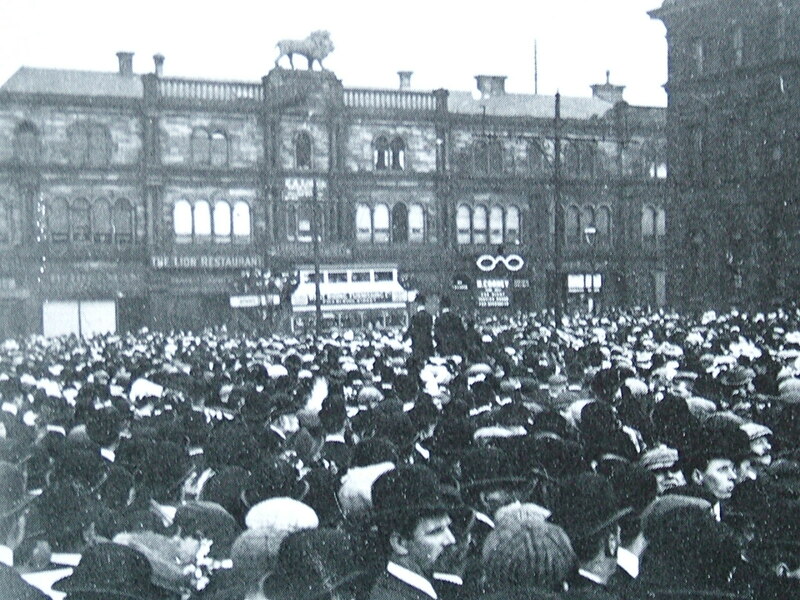 In October that year a ‘vast throng’ occupied the Square, accompanied by Liberal MPs, in a demonstration which local opinion considered the biggest and most important political gathering hitherto held in the town. The extension of the vote, the redistribution of parliamentary seats and disenchantment with the Liberals in turn gave rise to the Labour movement, which also staked out a claim to the Square. 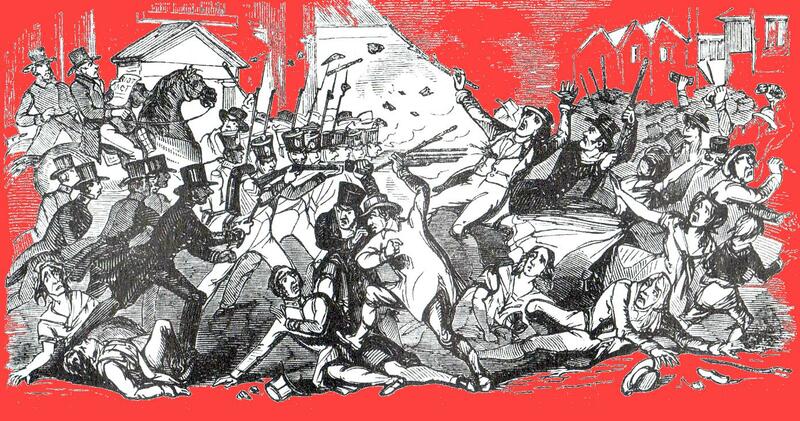 In 1893 the first Mayday rally was held for the eight hour day and, until the Great War, the annual march to the Square became the highpoint of the Labour calendar. Manifestations of communal sentiment, other than the desire for political or social reform, also found expression in the Square, from the thousands who came to greet Belgian Refugees arriving at the Station in 1914 to the 3,000 or so who joined the Armistice commemoration called by the railwaymen of the LMS Company in 1930. May Day demonstration, St George’s Square, 1907. Through all the century and a half of momentous historical changes in public attitudes, social awareness and cultural values, the original symbols of empire have endured. But the simulacra, like the ideal they embodied, remain elevated beyond the field of vision and comprehension of most passers-by. Although their resonance may have faded, they still retain a certain poignancy because they unashamedly invoke such a nostalgic era. The Lion, a metaphor for strength, was always an illusion. Wingless, unlike Venice’s Lion of St Mark, it was nevertheless credited, (probably by those leaving the George after one too many), with the ability to descend into the Square. Made of artificial Coade stone, the tail of the imperial beast was not simply tweaked, but inauspiciously broken off in a storm shortly before the opening of the shopping arcade in January 1854. Corroded beyond repair a fibre glass replica was substituted in the 1970s, a simulacrum of a simulacrum, as hollow as present day delusions of imperial greatness. Even more ironic, opposite the Lion, and firmly on the ground, now stands the bronze image of one of the men who presided over that retreat from Empire. Harold Wilson serves as an icon not of political greatness, but of the homespun values which moved the creators of the Square, civic pride, public service – and an evangelical faith in the benefits of technology and commercial prosperity. The only building in the Square to suffer any notable structural alteration has been the Britannia Buildings, bought from Crosland’s executors in 1924 by Huddersfield Building Society. In 1927 local architect, Clifford Hickson, redesigned the ground floor to create a modern banking hall, replacing the original fenestration, with its carved masks of classical deities, by a large windowed frontage decorated with a meaningless pastiche of ornament, including, over the new doorway, an ‘Egyptian’ solar disc. If this arcane symbolism was anything more than a fad and has any relevance to savings and mortgages, its statement is now incomprehensible. There is no doubt this renovation detracts from the integrity of the character of the Square. Although the modern shop fronts of the Lion Arcade intrude more rudely on the senses, at least they can be easily restored to harmonise with the original proportions and style of the rest of the building. It is the character of the Square as a civic amenity, an area of public activity which has suffered the most drastic change. Even cluttered up with horse cabs and criss-crossed by a tracery of tram wires it remained essentially an open space. The dominance of the motor car destroyed that. The Square has been sacrificed to the car, dissected by traffic islands, artificially sanitised by flower beds, and made inaccessible to human activity. Then came the supreme folly of the tawdry ‘Venetian’ fountain installed in 1974, in local parlance ‘neither use nor ornament’, its non-local stone both aesthetically inappropriate and impractical, consuming more public space and defiling the vista in every direction across the square. The Square never achieved the vision of its original promoters – a great open public space at the very centre of town, a focus of commercial and civic life, an Athenian Agora, Forum Romanum, or Venetian Piazza. It will now never become the topographical centre of the town. The ring road has seen to that. But it could become its cultural centre and by striving to make it so, the historical ambition of the Square may yet be fulfilled. The improvements to the station approach show what can be achieved. Although there will always be need for vehicles to access the station it is not inevitable that this should dictate the role of the Square. With traffic kept to a minimum, access limited and the tarmac replaced by flags and sets of local stone, it can, ‘at [relatively] trifling cost’, be open again to public activity – fairgrounds, concerts, markets, theatre, sports, exhibitions or public assemblies. A space un-blighted by street furniture, fountains, or trees, which have no historic meaning and detract from the function of the Square. ‘…every stranger who alights from the railway must be filled with amazement that so much money could have been expended and so ineffective a result obtained’. I drove around st George’s Square yesterday and the symbol above the door of the Britannia Building, far from being a ‘meaningless pastiche of ornament’ in fact derives from the Hermetic tradition. That, popular in Freemasonry and the newly emerging Victorian esoteric revival, was itself representative of Egyptian/Hellenic alchemy. It is a form of Caduceus and very appropriate to banking. thanks for your information about the Britannia building. I am referring to the late 1920s alterations here, so it doesn’t fit in with your ’emerging Victorian esoteric’ theory. The linking of Egyptian and Hellenic symbolism makes sense if it has alchemical origins, via freemasonry, but would a bank in the 1920s want to be associated with this ??? I think it has more to do with the fashion of Egyptian ornament following Carter’s discovery of Tutankhamun’s tomb – but I could be wrong and will look into it when I have time.